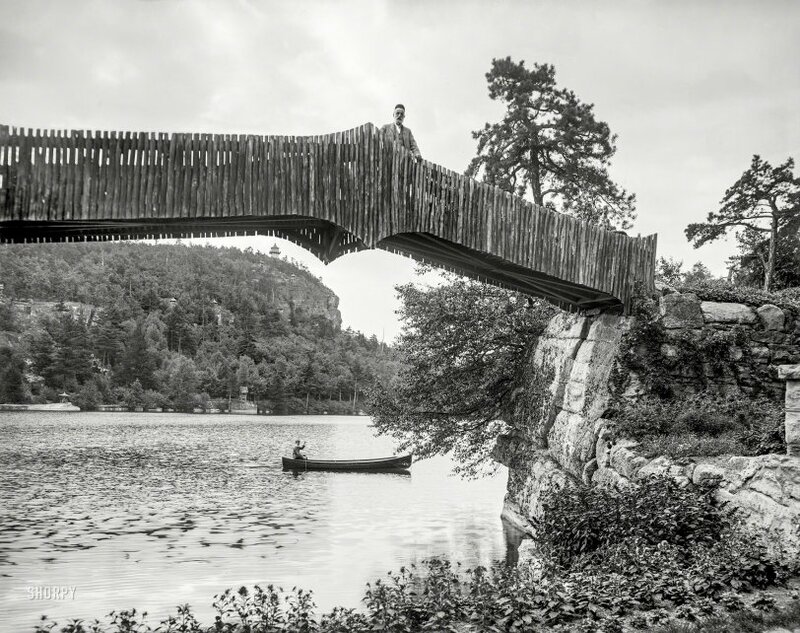 Mohonk Lake, N.Y., circa 1902. "Sky Top from rear of Mohonk Mountain House." 8x10 inch glass negative, Detroit Photographic Company. View full size. Submitted by timothy schuyler on Mon, 02/11/2019 - 1:00pm. You can just see Sky Top below the center of the bridge.The bridge is long gone. I worked there in the late sixties until 1971. Started as a waiter and did many other jobs, from building roads to running the climbers camp to renting boats on the lake. The "gunks", as they're called, are known to be the best rock climbing place in the eastern U.S.
Mohonk has the largest barn in N.Y. state. At one time they had about 200 horses. They would cut the ice in the winter and store it in another huge barn with double walls about a foot apart. The area between was filled with sawdust.The ice lasted all summer. Mohonk was founded in 1869 two Quakers, the Smiley brothers. It is still owned by the Smileys. Google it for what it looks like now. Submitted by rivlax on Sun, 02/10/2019 - 1:08pm. About 10 years ago, on a vacation trip from North Carolina to New Hampshire, we stopped in New Paltz, NY, in hopes of visiting the Mohonk Mountain House, which we had learned about on at TV travel show. But when we got to the gate at the bottom of the hill they told us that only guests were allowed up the mountain. I explained that my wife and I love to visit historic hotels, and just wanted to look around. He said he'd give us an hour, so we got in. We ate lunch in the restaurant and wandered the grounds, and I have to say this rugged Adirondack-style resort is one of the more impressive hotels we've ever visited.